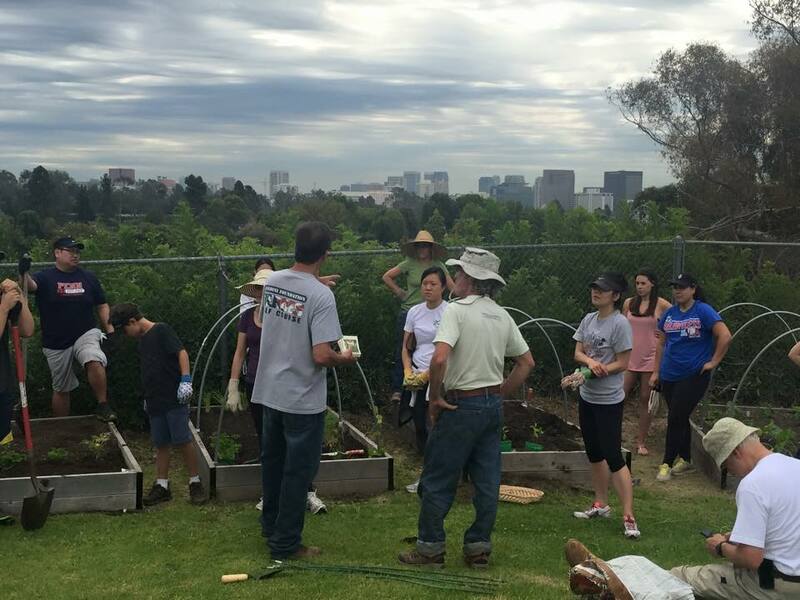 Since 2012, Penn Serves LA has been dedicated to the mission of providing Penn alumni with vetted opportunities for meaningful community service in the Los Angeles area. We work with a diverse mix of community organizations, with hands-on programs in a variety of locations throughout the city, all under our motto of SERVE, LEARN and HAVE FUN too. In some cases, Penn alumni become involved with the organizations we serve on an ongoing basis. The projects and the impact of Penn Serves LA, along with the engagement of our participants, during 2016-2017 are described below. 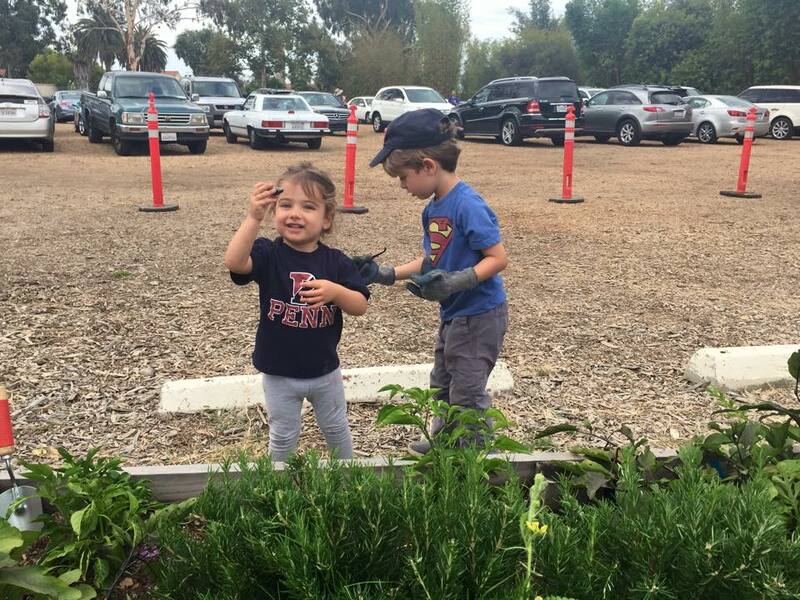 This past year, Penn Alumni, along with their families and friends, participated in a broad array of service activities across a wide swath of the LA region. Our projects included home building, fruit picking, blanket crocheting, food re-purposing, fluorescent painting, and literacy celebrating. We welcome all Penn alumni and their families and friends to participate at our events and are deeply grateful to the many people who participated in our projects last year, whether one time or frequently. 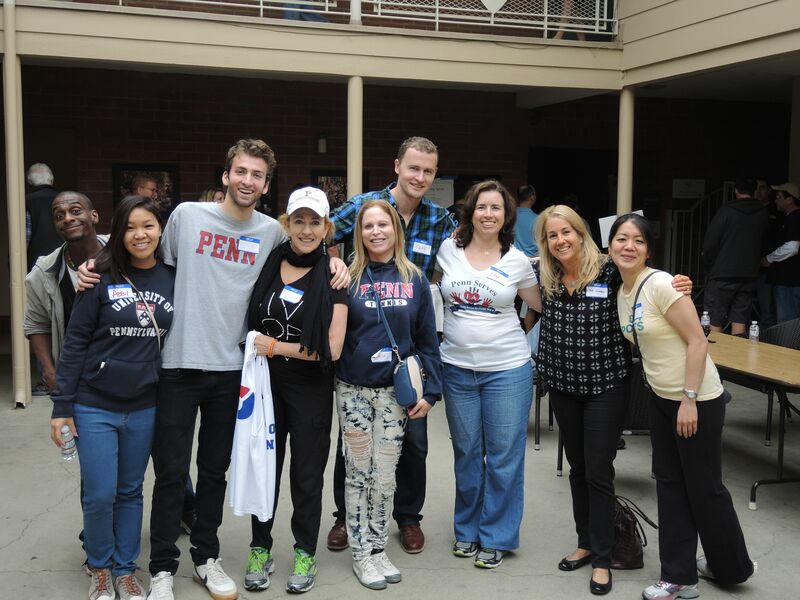 Through active engagement, Penn Serves LA builds bonds among our alumni, across all years and schools, while contributing to the strength of our great city. Please Email us to be added to our Penn Serves email list. And Like us on Facebook, and follow us on Twitter and Instagram. 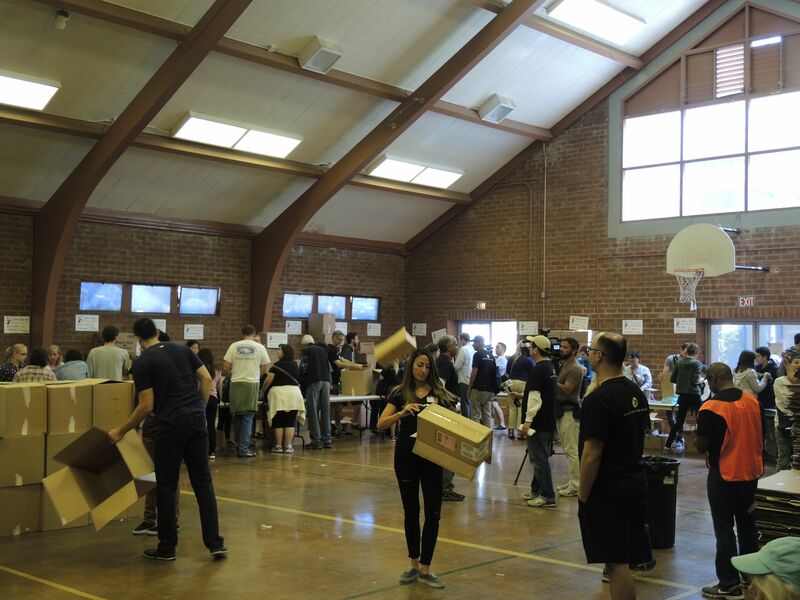 Read about all the people and animals that have benefited from the efforts of our Penn Serves LA volunteers during the last academic year (click on the date to read about our event and on the organization name to learn more about the organizations we helped). October 2016: Got Books? Led by CEO and Penn alumnus Parker Hudnut, ICEF Public Schools is a Los Angeles based charter operator that oversees nine inner-city charter schools serving over 3,500 K-12 students. Penn volunteers staffed a wonderful literacy day, helping with craft projects, reading to kids, and generally sharing their love of books with the eager young students and their families. November 2016: Alumni made a visit to LA Kitchen, an organization working to empower, nourish and engage our community by reclaiming and repurposing healthy, local food that would otherwise be discarded. Alumni donned aprons and wielded large knives to convert bruised fruits and vegetables into healthy meals for seniors and the disadvantaged. Penn Serves LA volunteers pose with members of L.A. Kitchen after a morning spent chopping, slicing and dicing food. January 2017: Penn Serves volunteers were trained in the art of crocheting with the lofty goal of creating soft, cheerful handmade blankets. Blankets of Love donates these works of love to bring some sense of security and joy to babies leaving Martin Luther King, and other area hospitals, with mothers and families who have little or no means, or who are living on the street. January 2017: We toasted Ben Franklin’s birthday and the New Year at a festive cocktail party. Our attendees took a moment to share a bit of their Penn story and their motivation for engaging with Penn Serves LA. As is true at all events, a wonderful cross-section of Penn schools and years were represented and hearing the stories about people choosing to commit time and energy to improve our city was most inspiring. April 2017: For the second time, Penn alumni partnered with Habitat for Humanity for a lengthy, exhausting and most memorable day of working on a new home side by side with the family that will live there. People caulked, sawed, framed, installed siding and generally felt terrific about learning new skills and contributing to creating a lovely home for a family in need. 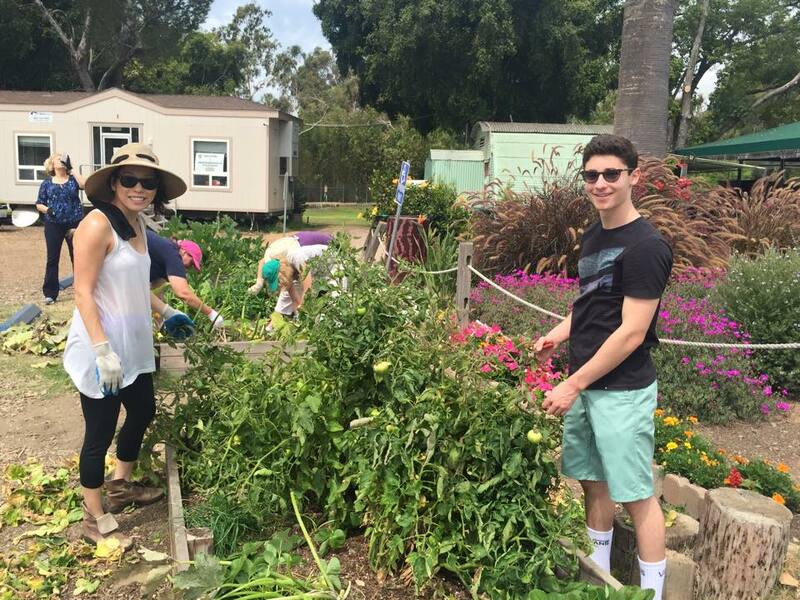 May 2017: On a very hot day, alumni drove great distances to Orcutt Farm to work with Food Forward, an organization that has “rescued” over 100 million servings of fresh local produce in the past eight years. We spent the afternoon in an orange grove with other volunteers and picked 6500 pounds of fresh oranges, which would be delivered that very day to some of the 300 shelters, senior centers, and agencies Food Forward serves. July 2017: It was a happy day when Penn Serves volunteers spent an afternoon using fantastic fluorescent colors to paint flowers on enormous disks. Portraits of Hope was started in 1995 to develop motivational art projects to provide creative therapy for children with special needs, and civic education for students, by producing dynamic public artworks. The 1000 disks we helped to create will be distributed to adorn and brighten animal shelters throughout the city. 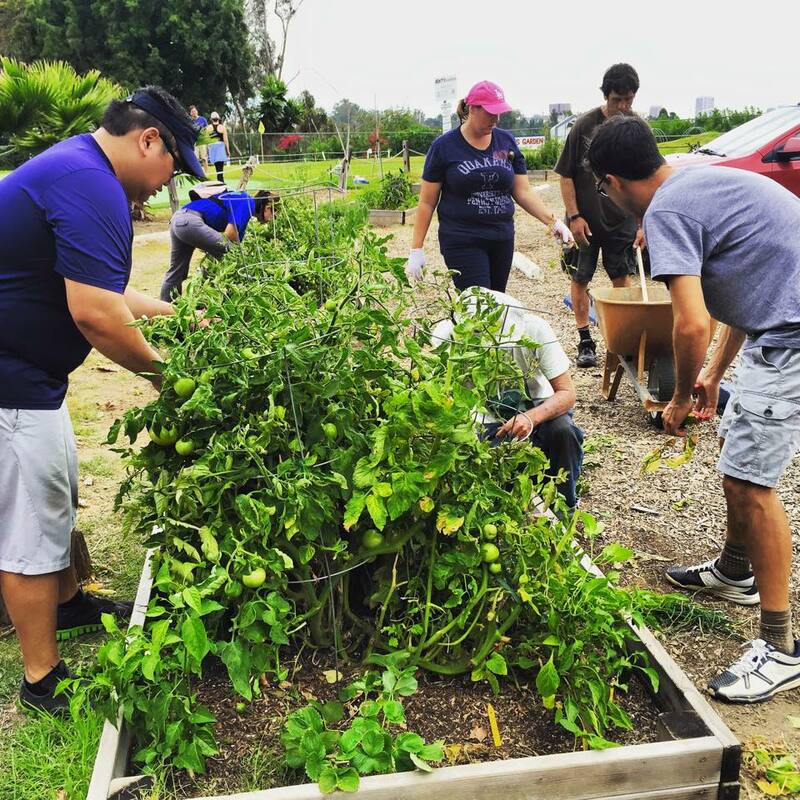 August 2017: For our final project of the academic year, our volunteers assisted LA Works, an umbrella organization that, like Penn Serves, strives to empower Angelenos to address pressing social issues through volunteerism and community collaborations. The activities this day were focused entirely on the pressing issue of family and youth homelessness, and we listened to first-hand stories, created fleece blankets, packed necessity kits and the like. 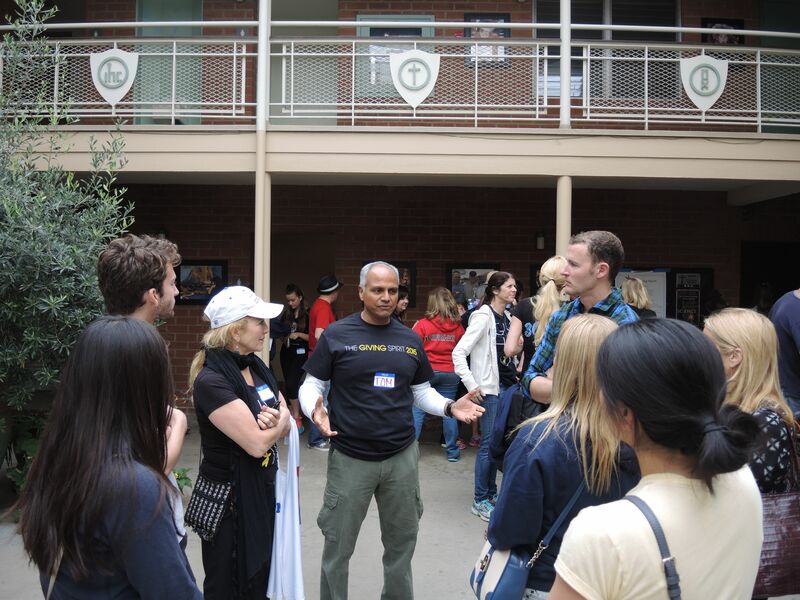 Penn Serves LA impacts the Los Angeles community by engaging University of Pennsylvania alumni, parents and families in meaningful community service activities. Since our founding in 2012, we have done everything from serving meals to the homeless to restoring the environment to fixing homes. Six times annually, we find another great opportunity to learn about interesting nonprofits, lend a hand and enjoy a fun experience with fellow alumni. We invite the Penn community in Los Angeles (alumni, parents, and kids) to join us at a future event, to help spread the word and to help us plan future activities. Join us, meet new Penn people, demonstrate what service means to your kids and friends, and help fellow Quakers make a little bit of difference in our complex city! If you have an established nonprofit that you would like us to consider for future events or announcements, please let us know. We are looking for new nonprofits to serve in meaningful ways. Questions? Want to join our email list? Reach us at pennserves@gmail.com. August, 2014 – Penn Serves LA Strikes Again: This Time with Paint! Almost 100 students and family members joined the First Annual ICEF Literacy Festival, staffed by Penn Serves LA volunteers. The event was held at the newly-built View Park Preparatory Accelerated Charter Elementary School, one of the schools of ICEF Public Schools located on Crenshaw Boulevard in Inglewood. Led by CEO and Wharton graduate Parker Hudnut, ICEF Public Schools is a Los Angeles based charter operator that operates nine inner-city charter schools serving over 3,500 K-12 students. ICEF’s goal is to prepare all students to attend and compete at the nation’s top 100 colleges and universities by focusing on the 3 As – Academics, Arts and Athletics. When approached by Penn Serves co-founder Denise Winner, W’83, with how Penn Serves might assist ICEF, Parker jumped at the opportunity and worked with Denise to develop the concept of hosting a day around books and literacy. “We host an Arts Day and Sports Day, so a Literacy Festival was the perfect catalyst to connect Penn Serves and our mission,” shared Hudnut. Students had access to a camping-themed reading room with tents and flashlights, a free book exchange, classrooms set for reading out loud, and book-themed arts and crafts tents. Three local children book authors were on hand for impromptu readings and conversations on why they wrote their books. Penn Alumni were encouraged to bring their own children to both celebrate literacy and provide a working hand. Throughout the day, Penn alumni were offering their reading help to younger students and creating crafty projects with young students, while older elementary students demonstrated their reading skills by reading out loud. “It was a great day for all – and fun to share our love of reading with the students,” shared Kiera Reilly, C’93, one of the Penn Serves board members. ICEF team members hope to make the event an annual fall event and hope Penn Serves will continue to be part of its success going forward. Penn Serves LA volunteers, ICEF staff and students are excited about reading! You can see more photos from the ICEF Public Schools Literacy day here. We have done everything from serving meals to the homeless to restoring the environment to fixing homes. Six times annually, we find another great opportunity to learn about interesting nonprofits, lend a hand and enjoy fun experience with fellow alumni. We invite the Penn community in Los Angeles (alumni, parents and kids) to join us at a future event, to help spread the word and to help us plan future activities. Join us, meet new Penn people, demonstrate what service means to your kids and friends, and help fellow Quakers make a little bit of difference in our complex city! 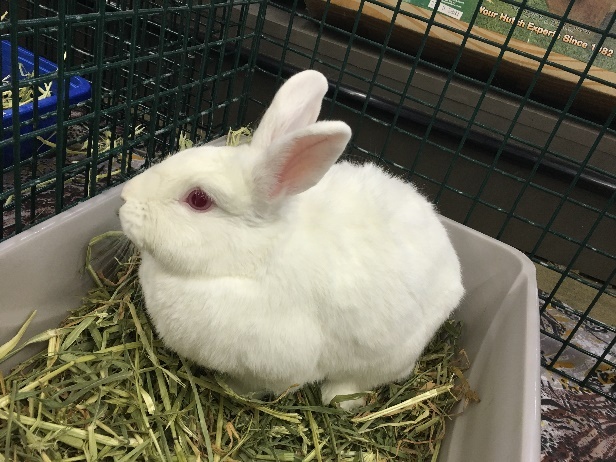 Did you know there are more than 5,000 bunnies seeking homes in the Los Angeles? And, did you know that rabbits can be house trained and make wonderful pets? Penn Serves spent an afternoon nuzzling, cuddling, playing and socializing with the abandoned bunnies. Alumni nestled in the crates with one to three bunnies, each bunny having its unique personality – bashful, adorable, playful, and super huggable! The Los Angeles Rabbit Foundation battles the escalating over population of bunnies. Its mission is to rescue, rehabilitate and place abandoned rabbits. Weekly, the Foundation hosts rescue events at Centinela Feed in Los Angeles. The rescue is always looking for volunteers. And, for those of you interested in trying out a bunny, consider fostering a rabbit. For more information, contact losangelesrabbits@earthlink.net. Penn Serves LA has many terrific projects for all ages on the calendar for the coming months. Questions? Want to join our email list? Reach us at pennserves@gmail.com. Like us on Facebook and follow us on Twitter! This Saturday, Penntertainment, Wharton Club of Southern California, Penn Club LA and Penn Wharton Club of Utah (with Ivy Entertainment) host the 4th Annual Penn/Wharton Sundance Schmooze in Park City during the Sundance Film Festival. If you are in town for the film festival or for skiing and snowboarding, or if you live in the area, please join us. Advance registration is required. Meet up with fellow alums in Media, Entertainment, Arts & Technology! Network with old and new friends who are working or playing in Park City. This year we have also opened it up to the IVY Entertainment group! Spread the word and invite your Penn and Wharton friends! Thank you to Matt Rosler, Barbara McCullough, and Caroline Waxler for this review. To see all the pictures from last year’s event, visit this Facebook page. Alumni made a strong showing at the Sundance Film Festival this year, taking a break from deal-making, movie-going, promoting—and skiing!— to attend the 3rd Annual Penn/Wharton Sundance Mix & Mingle. Over 200 people showed up on Saturday, January 24th, at the fabulous Spur Bar and Grill on Main Street in Park City, Utah, for an afternoon of schmoozing with their fellow Quakers at the event sponsored by Penn Club Utah, Penntertainment, Penn Club LA, PennNYC, and Wharton SoCal. Since the festival attracts creatives and business types from the worlds of media, entertainment, the arts and technology, the Penn gathering was filled with amazing conversations. From what we hear, there were more than a few connections—and potential deals—that resulted from the event. Among the alums in attendance were: Allen Fischer, partner at Principato-Young Entertainment; Marc Simon filmmaker and attorney at Cowan, DeBaets, Abrahams & Sheppard; Adam Tsekhman, actor (Tsili); Claude Ellis, CEO of vegan meal replacements company Naturade; Sara Braca, senior brand manager of Sabra; Frances Reagan Copinga, managing director of Reagan Outdoor; Steve Corbato, Ph.D., interim Chief Information Office of the University of Utah and the former co-president of the Penn Club Utah; Paul Zane Pilzner, international economist and bestselling author; and Scott Kaplan, head of distribution at Filmbuff. Slava Rubin,Wharton ‘00, CEO of the film funding site Indiegogo, stopped by after a press conference announcing his company’s groundbreaking partnership with the video-sharing site, Vimeo. Rubin was being trailed by a PBS film crew doing a special on the highlights of Sundance 2015. We couldn’t agree more than the 3rd Annual Penn/Wharton Sundance Mix & Mingle was one of the highlights. Many of the attendees expressed interest in the joining the ranks of the planning committee —Barbara McCullough, Evan Eneman, Caroline Waxler, Matt Rosler—for next year’s event. If that’s you, to, please contact us at penntertainment@gmail.com. We have big ideas for next year including panels and a larger program. W are looking forward to seeing even more alumni in Park City for the festival next year! For the complete photo gallery of last year’s event, please visit here. RSVP for the 4th Annul Penn/Wharton Sundance Schmooze here! We hope to see you on Saturday! Penn Serves LA visited the Westside Food Bank in Santa Monica on October 24 to lend a hand. Here is the report of their day by Jane Gutman, CW’73, PAR’14, PAR’16. 18,000 pounds of fresh pears, apples and peppers arrived yesterday, to everyone’s surprise, at the Westside Food Bank. In a few days it would rot… Quakers to the rescue! Feeling pumped following last night’s under-the-lights football win over Yale, over twenty-five members of the Penn family met at the Westside Food Bank to pitch in for another worthy and enjoyable Penn Serves LA project. The food bank distributes 4.5 million pounds of food each year to 70 local social service agencies. Half of this food is donated through collection drives by churches, synagogues, schools, the mail carriers, etc., and in addition, the Westside Food Bank purchases an average of $16,500 worth of nutritious food each week. We were shown a moving video about the work of the Food Bank, the grateful recipients, and the importance of distributing healthy foods: more produce and protein, less sugar and fat. 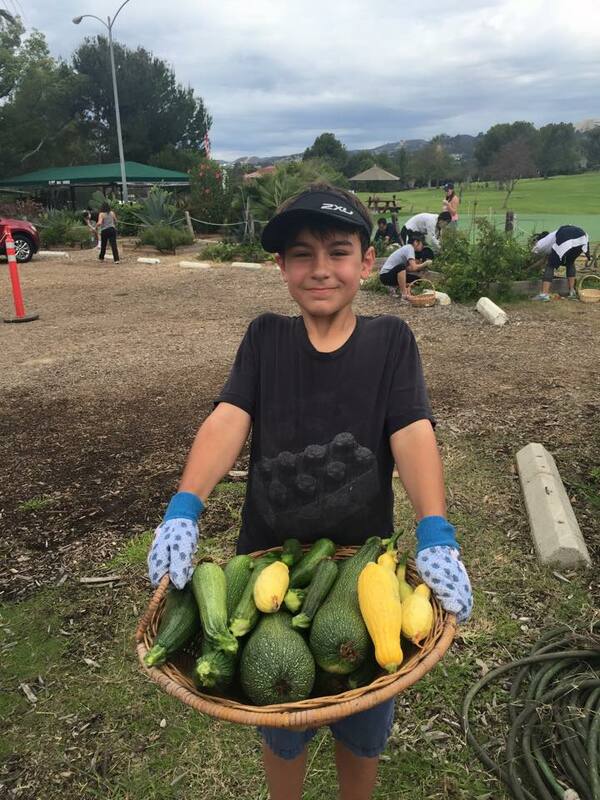 We were shocked to learn that the beautiful food we gleaned and packed today would have been thrown out by farmers were it not for the Food Bank’s efforts to collect healthy produce to assist our food insecure friends in LA. They pay a small amount to have this food trucked in, and whenever it arrives they need to quickly sort it and box it so that people can “shop” at local agencies for wonderful farm fresh fruits and vegetables. The Quakers built and filled boxes and worked in the hot sun to get the job done. As usual, we had all ages and all schools represented. The time flew by and the last box of peppers found its way into the cooler – we took care of 18,000 pounds of produce and felt good knowing a few thousand people would enjoy healthy snacks this week because of our efforts. In the midst of our intense and bustling city of somewhere between 13 and 18 million people, we find a few parks and refuges from the crowds. And for those whose budgets won’t allow for multi-thousand dollar initiation fees, there are also a handful of golf courses where anyone can pay to play. Penn Serves LA enjoyed the convergence of many treats for our recent project in July. We gathered at a wonderful, pastoral spot, which is also a golf course open to the public AND we had a bit of summer rain – a real slice of LA heaven. With gardening gloves and trowels in hand, thirty-odd alumni, friends and children brought the raised bed gardens at the Veteran Administration’s Heroes Golf Course back to life. No special skills were needed to hoe, weed, trim, harvest, re-plant and re-stake these beds, and it was the most satisfying work. 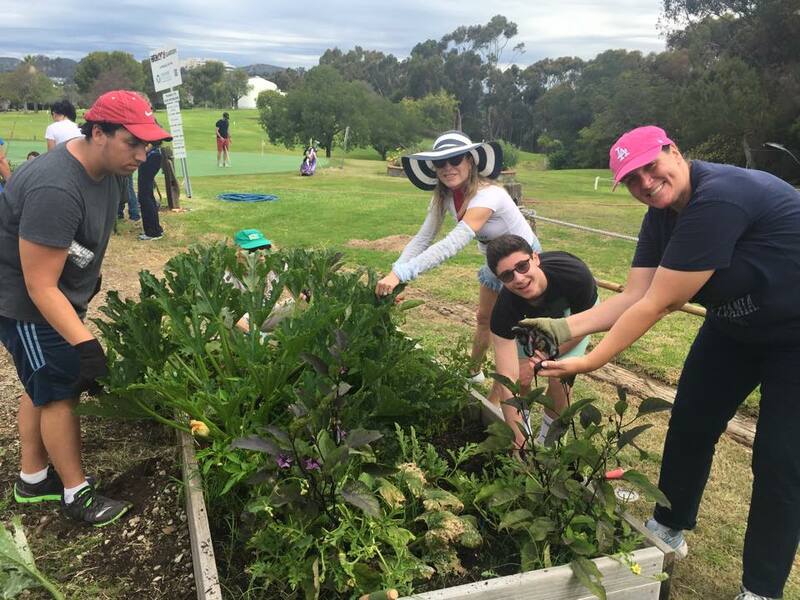 After less than three hours our Quakers had literally transformed the gardens from their sad state of affairs, to flourishing boxes of green glory…and in the process we picked basket after basket of zucchini, eggplant, tomatoes, herbs and more. The Executive Director of the Heroes Golf Course, Bruce Rosen, provided the group with a wonderful history of the VA in Brentwood. The golf facility itself, a 9-hole 3-par course, is most inviting and now all the more so because it is ringed by healthy raised vegetable beds, the produce of which is offered to any veterans who choose to come by and partake. We are grateful to Bruce and his associate Aviva for providing us with plentiful mulch, plants, tools and enthusiasm …and to the vets who worked alongside of our Penn volunteers. We hope people will support our veterans and this course by coming out to play a round, and meanwhile check out the fruits (and vegetables) of some fine Penn gardening labors…and let’s all hope for a little more rain! 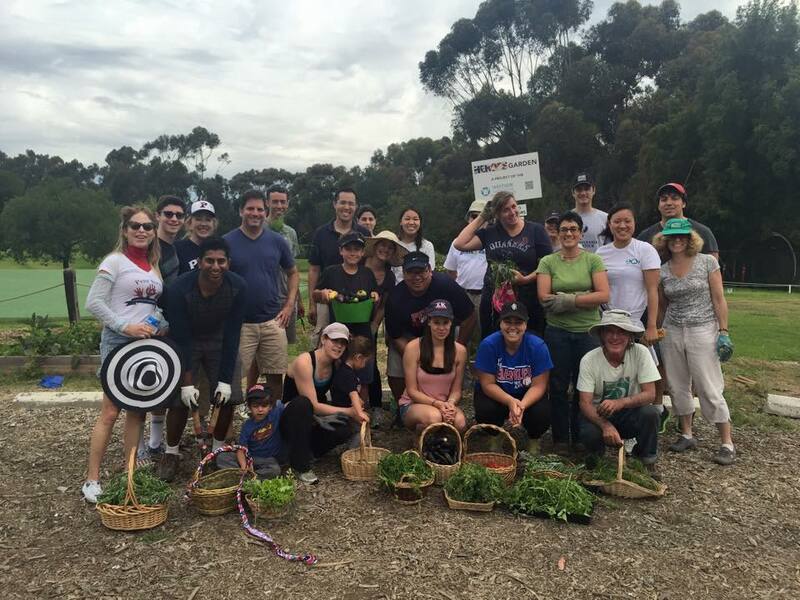 Saturday, October 24, 2015 – Westside Food Bank – only a few spots remain! Questions? Reach us at pennserves@gmail.com. Like us on Facebook and follow us on Twitter! 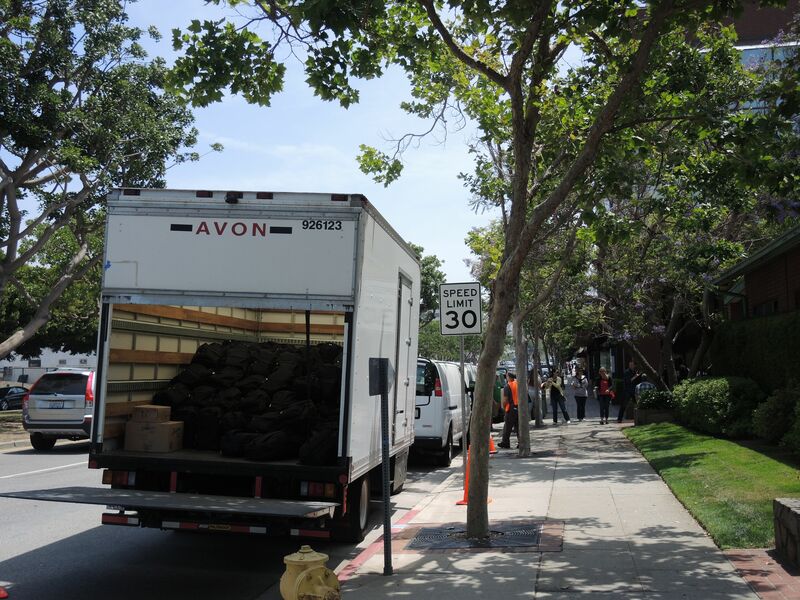 Wonderful Penn Serves LA volunteers joined in a fantastic effort on May 30th to provide a bit of summer relief for some of the 82,000 people in our city who are homeless on any given night. 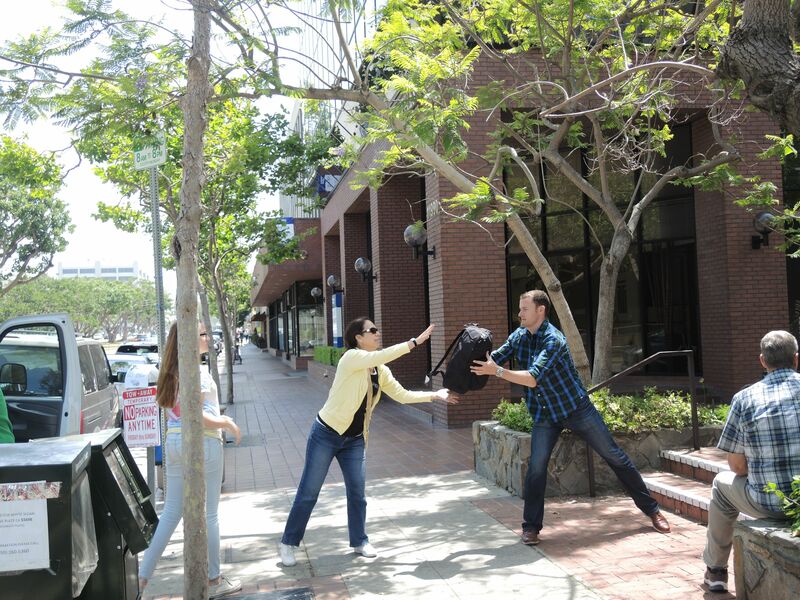 Founded in 1998, The Giving Spirit has raised over $2 million through small donations and served over 35,000 homeless. 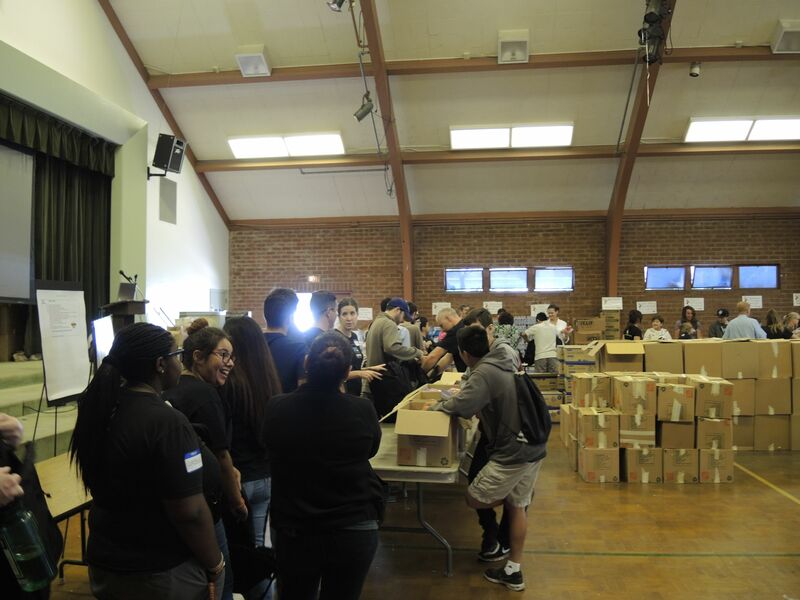 Twice a year this all-volunteer non-profit, the largest in the city, organizes the filling of backpacks and duffle bags with essential items (canned and fresh food, clean socks and hats, toiletries, etc. plus lists of available services) to help our friends on the street to survive and enjoy a bit of comfort during the hottest and coldest points in the year. Volunteers of all ages helped to set up the assembly line, then fill the backpacks. Volunteers at the beginning of the assembly line to fill the backpacks. But in addition to handing out these critical supplies, The Giving Spirit is unique in its approach: the organization’s leaders know they cannot cure homelessness, but when volunteers hand bags full of help, and maybe hope, to homeless people, they also look them in the eyes, engage them when feasible and let these disenfranchised people know that someone is thinking about them. The formula is a moving one, and through a short, televised video our Penn Serves LA volunteers received a glimpse into its effectiveness. Jane Gutman introduces The Giving Spirit’s founder and Chairman Tom Bagamane to the Penn Serves LA group. Tom talks to the group about the founding of The Giving Spirit and the work that they do to help the homeless in Los Angeles. Penn Serves’ Jeff Weston, C’05, helps load the filled backpacks into vans for distribution. One truck filled with backpacks ready to be distributed. Penn Serves volunteers at The Giving Spirit. Penn Serves LA has many terrific projects for all ages on the calendar for the coming months, including a day of painting on June 13th at Valiente College Preparatory Charter School, a brand new school for underserved kids opening this fall. Join us this Saturday – RSVP here. Join us, meet new Penn people, demonstrate what service means to your kids and friends, help us Quakers make a little bit of difference in our complex city! Questions? Reach us at pennserves@gmail.com. Find us on the web, follow us on Twitter and like our Facebook page! August 2014 – Penn Serves LA Strikes Again: This Time with Paint!